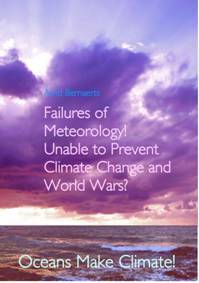 Read the new Book Publication - 2012: "Failures of Meteorology? Unable to Prevent Climate Change and World Wars?" 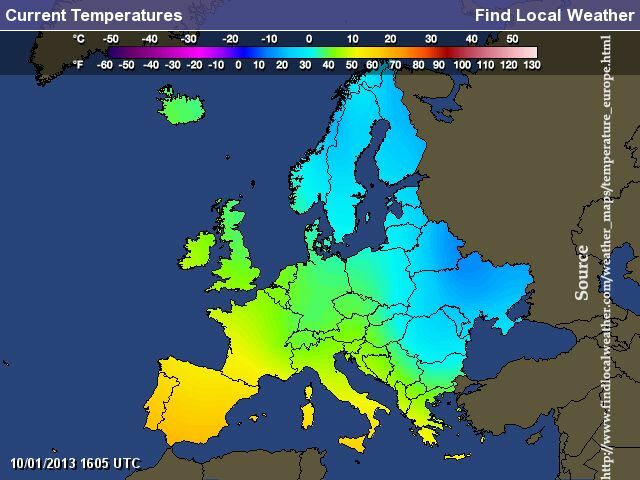 Record cold in Poland ! 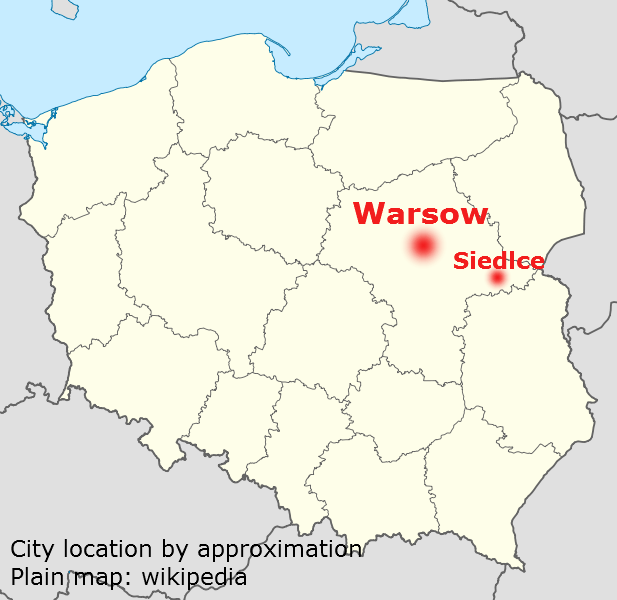 Minus 41°C on 11th Jan.1940 in Siedlce! And man has nothing to do with it? Since the 1st of January a cold corridor with less than -10°C streched from West-Germany eastwards. 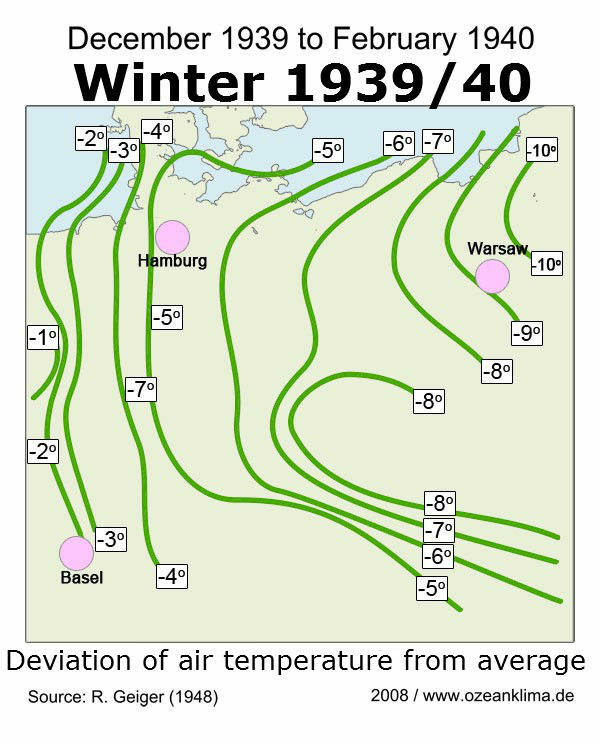 On January 11, 1940 the tempertur minimum had been -18.3° and in Berlin -22°C. (Source: WZ: Wetterwerte). Of course, the cold record in Poland is a whim of heaven, and man has nothing to do with it! Or? 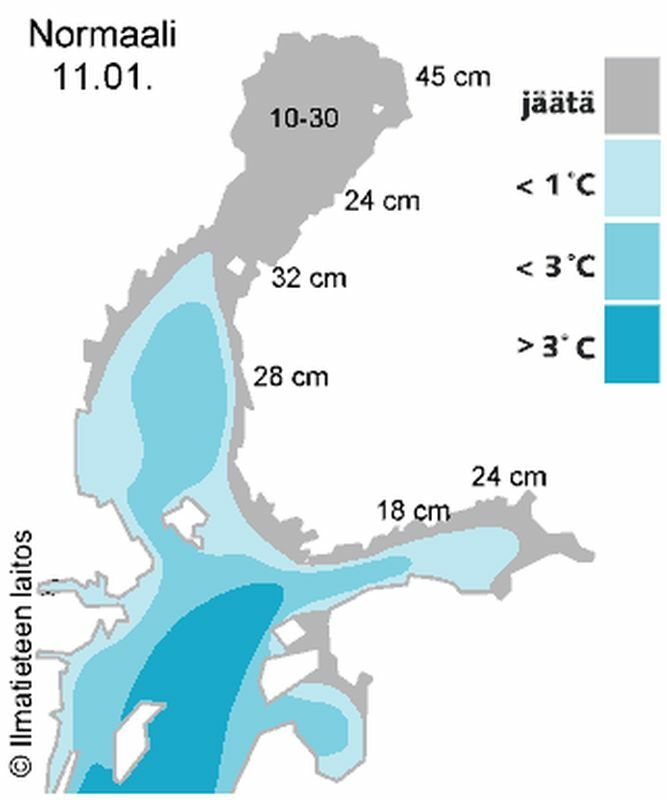 A comparison between the Baltic sea ice conditions on January 11, 1940 and today (07/Jan/2013) may shed some light on the exceptional situation 73 years ago. 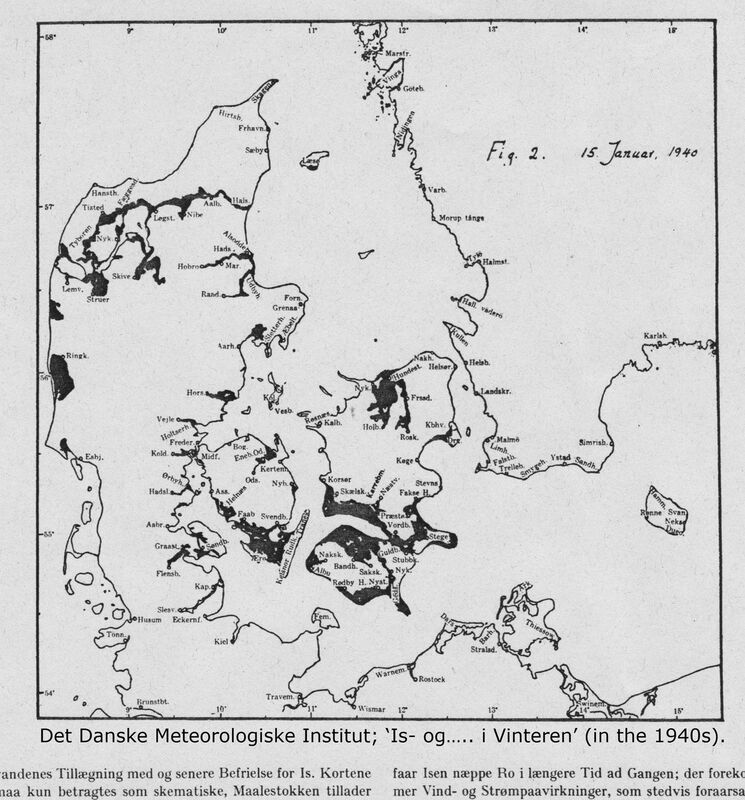 While sea ice started extreme early in the German Bight (on 16/17 December 1939 - Details HERE -Chapter 7, sec.h), and Denmark followed few days later (Fig. 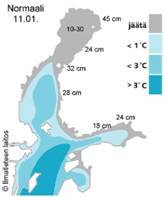 4), the Baltic Proper remained quite open well to the end of January (Fig.5). 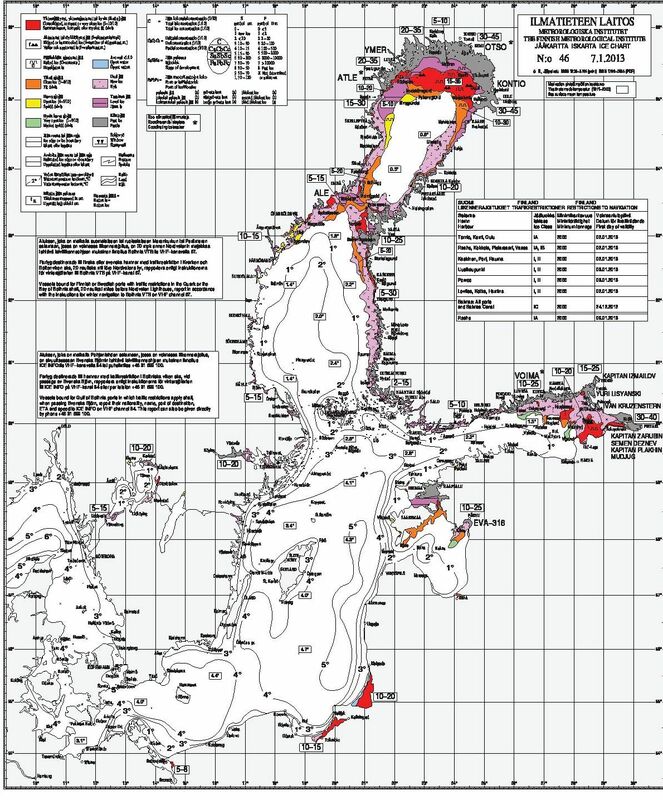 The situation today (07 January 2013) is shown in Fig. 6 and 7 (for December 2012 see: HERE). Fig. 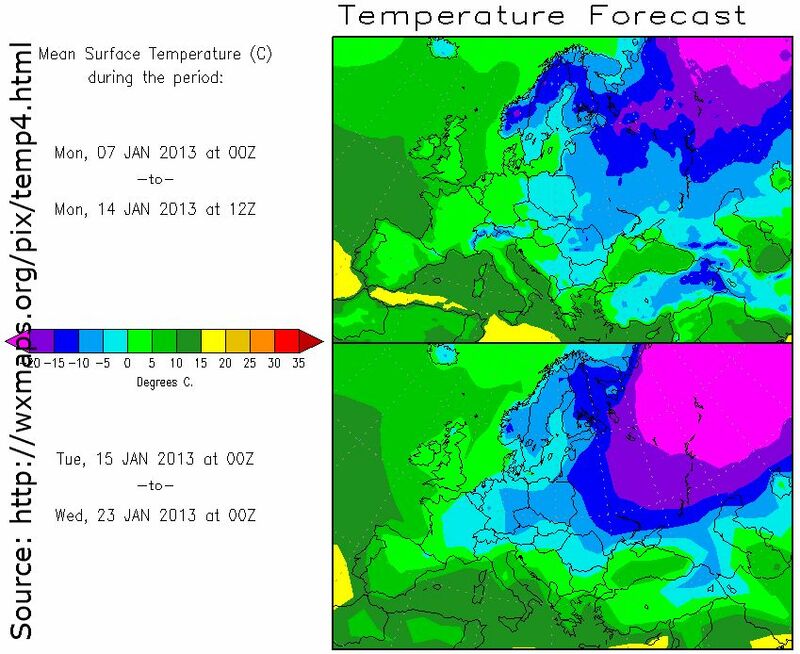 8 gives a temperature forecast for two weeks until 23rd January. 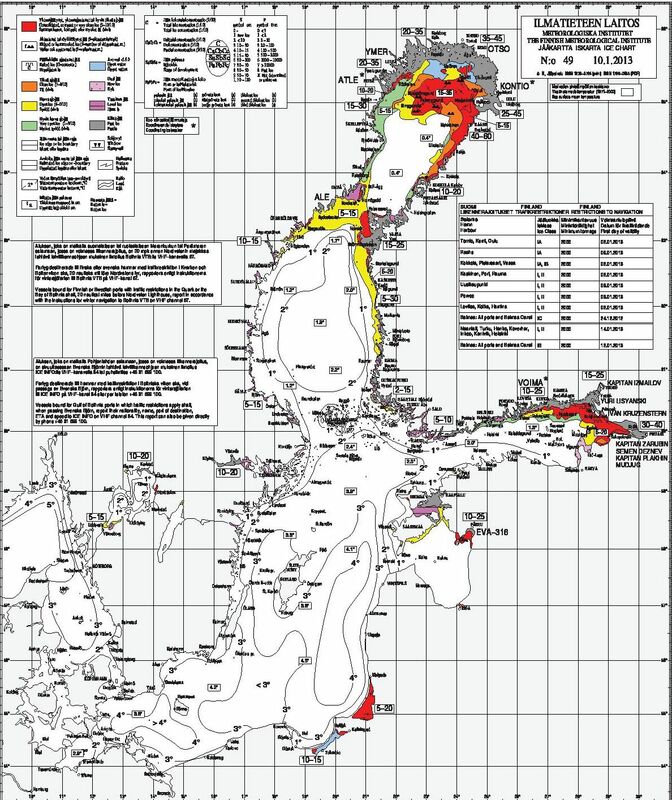 It is interesting to note, that the land areas around the Baltic have to expect much lower temperature than the sea area. Fig. 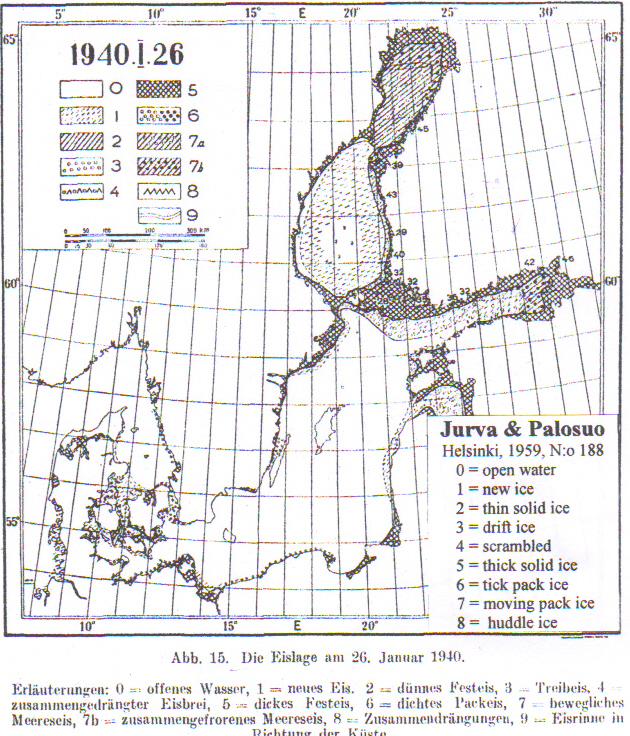 7; Average ice on 11.Jan. 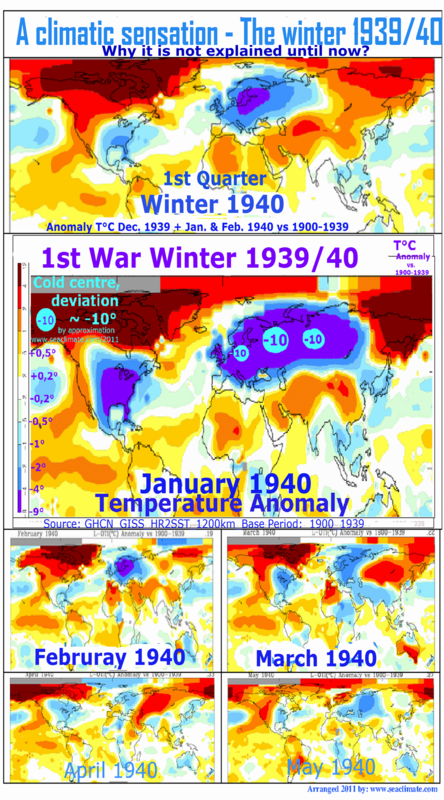 A comparison between the situation by mid Jan.1939 and mid Jan. 2013, the next block shows a number of temperatures 73 years ago, followed by information concerning today (10. 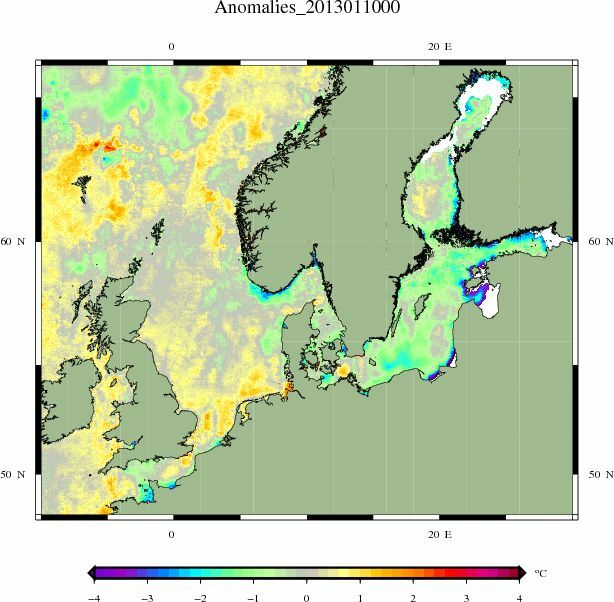 Jan.2013), raised the question for the reason of this big difference, which presumably is correlated with to low sea temperatures in the North- and Baltic Sea . As already mentioned in the 1st Update, there had been serious sea ice in the German Bight since the 17/21 December 1939. On the night of the 23rd, a minimum of -23.3C was recorded at Rhaydaer(Powys) a record low for that date. Other lows include -20C at Canterbury , Welshpool, Hereford and Newport in Shropshire . Moscow measured as lowest −42.2 °C (−44.0 °F). But as records are only one side of the picture, a brief list of selected events reported by the New York Times, NYT, if not otherwise indicated, is herewith produced. 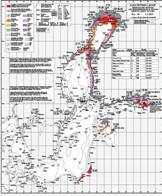 __ January 01: All navigation on Danube stopped owing to ice (Frankcom, 1940). 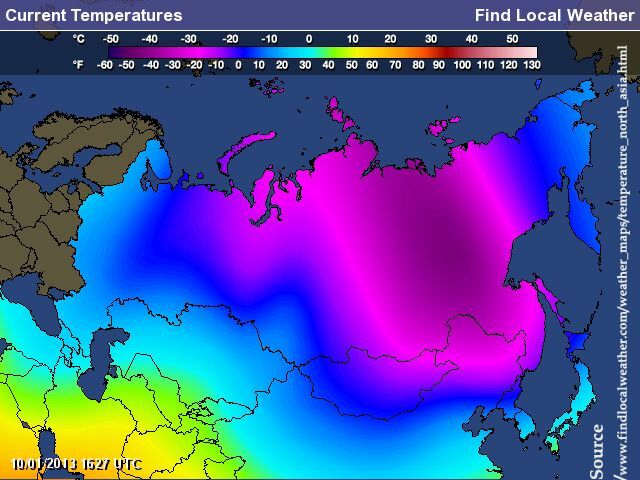 __ January 08: Record frost in Northern and Central Russia , -35°C/ -31°F. __ January 11: Romania , -40°C/-40°F. __ January 11: Sea freezing in the Black Sea near Odessa . __ January 11: Berlin , -20°C/-4°F. __ January 13: Soviet Union extreme cold, Don Region –38°C (NZZ, 14. Jan). __ January 13: Riga , the bitterest cold wave for years (-40°F). __ January 15: Warsaw –40°C/-40°F. __ January 17: Cold paralyses Northern Europe . Riga said that the temperature was at freezing point on Monday morning (January 15) and yesterday morning at 22 degrees below zero Fahrenheit. Then it tumbled to 47.2 degrees below zero – a drop of 79.2 degrees in about thirty-six hours. (NYT, Jan 18). cought up with the cold.